Faraway Pillow: Wherefore Art Thou Luggage? O Luggage, luggage, wherefore art thou luggage? Deny thy airline and refuse thy loss. Or if thou wilt not, be but sworn my reimbursement and I'll no longer be a disgruntled passenger. Hold off on that ‘happy-dagger’, you can’t get it through security anyway. There’s hope when it comes to lost luggage! Not many people know - and the airlines surely don't want to tell you - that airlines are obliged to cover all expenses caused by lost or delayed baggage up to $3,300 per passenger on domestic flights. Rush to the claim counter the minute you know your bags are missing. Often, other passengers’ bags are also missing. Each claim takes ten minutes or more which means if you’re not in the front of the line you could be waiting a long time. Delta? Aer Lingus? Qantas? If you’ve flown round the world on multiple airlines at which airline counter do you make your claim for lost or delayed luggage? The last airline to fly you is responsible for solving your luggage woes. All airlines have agreed, among themselves, that no matter who is at fault, the last airline that the passenger flies is the one accountable. If the airline deems your bag delayed they know exactly where your bag is and are 99% sure it will be delivered to its original destination. For whatever reason, sometimes bags miss their flights and are put onto the next flight to their destination. If you ‘have more care to stay than will to go’ and decide to wait at the airport for your bag(s), ask the airline for a meal voucher- it is cheaper for the airline to buy you a meal than to pay for the courier service to deliver your bag to you. If the airline declares your bag missing it is a bit more worrying. However, if the baggage claim representative does tell you your bag is currently completely lost, don't panic. Almost all of the bags that are missing at this early stage will be found in the next four or five days, and most of those will be found in the first 24 - 48 hours. Once your bag(s) has been declared delayed or missing determine the following: 1) how to keep in contact with the airline, and how the airline can keep in contact with you, until your bag's status is resolved, 2) What the process will be between now and the time your bag will either be delivered to you or declared lost for good, 3) What level of reimbursement can you expect for anything you need to buy between now and when your bags arrive. You’ve been on a cramped plane for hours, have paid an astronomical price for every in-air amenity, and waited ages in a queue to speak with a baggage claim representative. You’re in a new city without clean clothes, without a toothbrush and other essential toiletries. You’re forced to deal with a stressful and time-consuming problem during your much needed vacation. You’re desperate. You’re tempted to give your wardrobe a designer overhaul on the airline’s dime. Not so fast! If you need to spend money on things directly related to your baggage delay the airline is obliged to provide reimbursement. However, they will likely only cover reasonable, actual, and verifiable costs and agree to repay you for only essential items. Essential is not generally defined as the hottest Louboutin heels. In fact, airlines will deny claims they feel are inflated or fraudulent. Get the details of the airline’s reimbursement policies and liability limits before you go shopping. Make sure to buy only sensibly priced, essential items and save all of your receipts. Most airlines won’t offer assistance so be sure to ask. Don’t assume that you can send in your receipts when you return home and voila, you’ll be reimbursed. Usually the approval of a baggage claim representative is required for reimbursements. Request that any agreement made between you and the baggage claim representative be put in writing to facilitate reimbursement from the corporate office once you submit your claim. My luggage was delayed on an Aer Lingus flight from Dublin to New York City. I asked at the airline baggage claim counter for details on reimbursement and was given a $70 a day per diem. I purchased new clothes and toiletries that retain lasting value to me. I would have gone shopping in NYC anyway and therefore wasn’t inconvenienced. Better yet, I didn’t have to carry my massive bags through the airport and into the bustling city. They were delivered four days later to my doorstep. I submitted itemized receipts to the Aer Lingus corporate office and was swiftly issued a check for my expenses. Parting with your bags can be such sweet sorrow if you have persistence, patience and a positive attitude. Save your baggage claim ticket issued at check in! The baggage claim ticket includes a ten-digit numeric bar code that will track your bag wherever it may end up. The tag also includes vital information like name of airport of arrival, departure time, airport code of airport of arrival, airline code and flight number, name of passenger identified with the baggage (last name, first name). 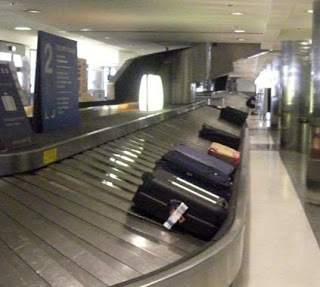 Identifying delayed or missing luggage without the baggage claim ticket can be quite an ordeal. My friend’s luggage was declared lost on arrival in Italy. He misplaced his baggage claim ticket and had no way of tracking his lost belongings other than by description of the bags. He called the airline multiple times daily and was soon on a first name, convivial basis with the baggage claim representative. The search lasted over three weeks and consisted primarily of telex communication between the three different airlines involved in his travels. The baggage was finally found and returned to him only after he spent his vacation and the following weeks after his return home dealing with the very frustrating situation. Between the time you check your luggage in to the time you claim it on the carousel it is likely to have gone through an elaborate maze of conveyor belts and baggage carts. Despite airlines' best intents to reunite you and your possessions upon arrival at your destination, luggage sometimes ends up in Mantua when it should have arrived in ‘Fair Verona’. While many star-crossed tales of lost and delayed baggage are told around the world, you can prevent yourself from becoming a character in such a drama by carrying on. In this day and age of costly baggage surcharges it makes sense to take your belongings on board with you. • Put your name on the outside and inside of your bags. • The most common causes of lost and delayed bags are late check-ins and tight connections. Avoid both when you can. • Make sure the person who checks your baggage attaches the correct destination ticket to every bag, and get a claim ticket for each. Be sure to keep this claim ticket safe until you and your bags are reconnected. • Pack a change of clothes in your carry-on bag so that you'll have something to wear if your checked bag is delayed or lost. • Travel insurance is the best guarantee that you'll recover any losses. • Always ask the airline for reimbursement and liability limit details. For never was a travel story of more woe than this of the jet set and their lost cargo. Save your baggage claim ticket issued at check in- probably the best piece of advice. Without that, you are in bad bad shape. I fear losing that while traveling like nothing else. Great tips right before the busy holiday travel season.